Stephen Ministry is a one-to-one lay caring ministry. 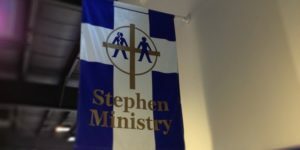 Stephen Ministry (Stephen Leaders and Stephen Ministers) enhances and equips the laity of the church to become informed and emboldened shepherds whose ministry provides one-to-one caring relationships with people in need and crises. Stephen Ministry provides trained and supervised lay-care givers who multiply the opportunity to provide care for those in need, allowing the elders of the church to oversee differently, freeing them up to implement God’s design for biblical elders and deacons. Stephen Ministers are people who have spiritual gifts in areas such as faith, mercy, teaching the faith, and encouragement. Stephen Ministers are people who listen, care, and have great empathy. They are patient, dependable, nonjudgmental, and don’t try to fix things or tell people what to do. They can keep things confidential, and they have the time to commit to this ministry. The Stephen Series is now in more than 8,000 congregations from 100 Christian denominations, in all 50 states, 9 Canadian provinces, and 21 other countries. More than 40,000 pastors, church staff, and laypersons have been trained as Stephen Leaders (those who oversee and direct Stephen Ministry in the congregation) at a Stephen Series Leader’s Training Course. More than 300,000 people have trained as Stephen Ministers in their congregations. Nearly a million people have received the structured care of a Stephen Minister in a one-to-one caring relationship, and millions more have received care in informal ways. Do you need the care of another person, a Christian friend, a Stephen Minister, to provide distinctively Christian one-to-one care for walking alongside you in your time of need? Contact us for more information.